Story: 1873. Arizona Territory. 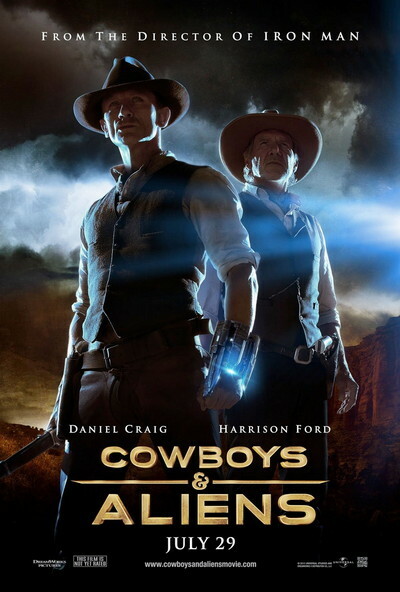 A stranger (Daniel Craig) with no memory of his past stumbles into the hard desert town of Absolution. The only hint to his history is a mysterious shackle that encircles one wrist. What he discovers is that the people of Absolution don't welcome strangers, and nobody makes a move on its streets unless ordered to do so by the iron-fisted Colonel Dolarhyde (Harrison Ford). It's a town that lives in fear. Now, the stranger they rejected is their only hope for salvation. As this gunslinger slowly starts to remember who he is and where he's been, he realises he holds a secret that could give the town a fighting chance against the alien force. With the help of the elusive traveler Ella (Olivia Wilde), he pulls together a posse comprised of former opponents - townsfolk, Dolarhyde and his boys, outlaws and Apache warriors - all in danger of annihilation. United against a common enemy, they will prepare for an epic showdown for survival.